Twenty years ago today, a brilliant neurologist told me I had multiple sclerosis(MS). It was a Monday. Not the best Monday I’ve ever had. Over the years, I’ve figured out that the doc was wrong. My body might – I don’t. Some days MS is the best thing that ever happened to me. Some days it’s not. There are three kinds of MS: relapsing/remitting; secondary progressive and primary progressive. My body has secondary progressive. As mentioned above, if you brought 20 people who have MS in their bodies into a room, you’d probably witness at least 20 different manifestations of it. MS seems to like being different in each person it chooses as its host. and several times a week I’m completely paralyzed from the waist down. Those are the less-than-preferred parts of my MS experience. and I’m always ready for Plan B (or C or Z). Even if it doesn’t look like it on paper, the gifts of MS outweigh the inconveniences – for me. So this day is a celebration for me. I plan to practice my yoga, pray, play with my dog & her visiting canine cousins, make some art, nap a lot and go out to hear some dear friends make music tonight – or not :). MS is a dragon I can’t slay. I sure can ride it though. We’ve all got our own dragons. How do you ride the ones you can’t slay? This is a hard one to reply to, because I am in such awe of your strength and grace as you ride, that I am left ALMOST without words. I suppose the thought that I am left with, in answer to your question, is that my dragon plays with my mind rather than my body; toying with me, telling me that I COULD slide right off and end this ride, if only I were a better person, making better choices, using my energy better, etc. etc. etc. So, knowing I will probably never really slay it (as I know I can NEVER reach its desired state of perfection) I just keep trying to make friends with it, offering nibbles of legal medication & reading soothing stories to it, to at least settle it down a bit! I for one am honored to call one of the most amazing women I know, my soul sis and friend!! I continue to be in awe of your strength and your gratefuless. I choose not to slay my dragon, but to be present with it everyday, honor it and thank God for allowing me to be present with whatever it is I need to learn and be aware of everyday of my life!! I really love this. I want to send it to all my fellow Southeast PBC support Group members who ride a slightly different dragon. ML, love love love your tips for making friends with your dragon. am gonna borrow that, k? Robin, thanks for the reminder for Presence and honoring dragons. YES! let’s all keep on riding! I am so thankful our paths crossed on those Holy Grounds of Trinity Center. Do you have any idea the difference you have made in my life… your faith and sense of humor are inspiring. As you know…I’ve had my share of dragons nipping at my heels. I am ready to quit fighting and running from my dragons….I think I’ll hop right on and enjoy the ride myself. Thanks Lisa. I’m sending this link to my special friend Mike who is alwo riding the MS dragon. You never cease to amaze and inspire me and “I thank my God upon every remembrance of you.” I am sending this to my son Nathan, who as you know, rides the dragon of Type 1 diabetes–his 11-year anniversary of diagnosis is Feb. 24. My own dragon is the fear of what Nathan’s dragon might do to him. Occasionally it turns around and breathes fire on me; I try to remember to throw up the shield of faith, and though I sometimes get blistered, I have not yet been incinerated and plan to ride on. Thanks for the reminders on how that’s done. Anne, i send you & your sis loud cheers as dragon riders ~ have a feeling you BOTH ride yours in glorious sass & style. 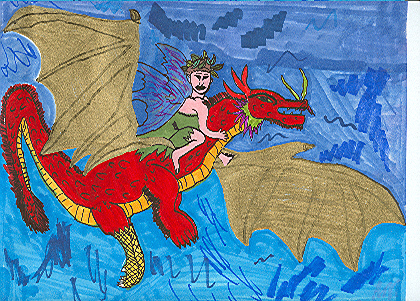 thanks to all who have commented… as we all know, dragon riding is best done together. It’s a privilege and a pleasure to know you!! Thanks for being my friend; I am the winner in this association. We learn to live by the examples of others; and while I have had many good teachers, your life and it’s journey to achieve homeostasis while fighting your battle with MS has added another dynamic dimension to my education. Your faith in God and your loving kindness to all who know you is a balm to the soul. As I have read the comments placed by others, I realize I don’t really have any dragons to fight; however, if and when I do, I will be so thankful to know there are so many patterns to follow. You are wrong about slaying your dragon called MS…it is obvious you have “slain” it…your positive attitude and outlook on life during your “dragon ride” are representative of human traits we all need to emulate when we are about to get thrown off whatever dragon we may be riding at the time. Sometimes, if we’re profoundly lucky in life, we find a true friend that helps us be more and be better than we would be if we were left to our own thoughts and actions. Lisa, that’s what you’ve given to me….the inspiration to be a better person. What an incredible gift. And you’ve given it not just through the way you’ve dealt with MS, but the way you’ve chosen to live your life….MS and all. Thanks for all you’ve given me. I am blessed by your friendship. I hope you had a wonderful day celebrating !!! I echo Tom’s words, (above). He says all that’s in my heart too. I’m so glad we are friends. Janice, Rick, Tom & Jan ~ knowing you all as i do, i’m beyond humbled by your kind words. you have all taught me much about dragon riding in your lives. you’ve all faced down some pretty big dragons in your lives. sure would love to know how you did it ;). in the meantime, may we all keep on riding! My dragon seems a bit insignificant when I read about everyone else’s dragons….. BUT…. as I have learned, I can’t compare my dragon to anyone else’s. To me, my dragon is huge just as to others their dragons are huge. I am just so very thankful that I have found an online group of friends who understand dragons and slaying them…. or better yet being kind to them and making them friends or at least “grateful awareness guides”. Lisa, I pray your day of celebration was wonderful and all it could be for you!!!! Thanks so much for sharing a part of this special day with all of us.